Feeling like you keep putting on the same event, over and over again? Have the urge to create something bigger and better? Want to keep up with the latest marketing movements? Leveraging the community aspect of events is your answer! There’s a growing desire of consumers to feel a part of something beyond one or two-day events. It’s human nature to love being part of a movement, connecting with others, and getting involved. Why not serve your audience and your brand better by leveraging your event and expanding it out into a true community? Event planners are beginning to see how events extend beyond the actual event, starting before the event begins and continuing long after the event has passed. The event lifecycle has extended as social media, new marketing strategies, and more conscious consumers have flooded the marketplace and encouraged companies to step up their game. The new marketing landscape is all about storytelling, connection, and relationship building! “Events as communities” is a great way to put these ideas into practice and increase the impact of your event. You have the ability to capture audience attention on a much deeper level than ever before, encouraging consumer engagement outside of the limited time you have available to host an event. Who will manage the community? This strategy requires other marketing experts past the event planner in charge of the event. It takes brand ambassadors to truly nurture a community and ensure the community stays focused. Be prepared to invest the personnel to make this strategy effective. What is truly the point of the community? What is the bigger movement that your audience relates to and can get behind? It could be environmental issues, conscious consumerism, buying local, or other big vision causes that your brand supports and believes in. Ensure the vision is aligned with your brand and is related to your event. What is really the goal with creating the community outside of the event? Perhaps it’s increasing attendance at the event, fostering connections between attendees, building customers for life, continuing the community yearly, or changing perceptions. There are a lot of reasons communities exist, but if you aren’t clear on the purpose of your community, then your lack of true connection will show and it will be confusing why it exists in the first place. Consumers are intelligent and picky about how they spend their time and where they spend their money. If you want your event to truly stand out, link it to a larger community that serves a true purpose for your audience and your brand. Connection is currency and your event community can prove to be well worth the effort. Let's talk safety at events. Check out our tips on considering safety at events. PLANNING EVENTS IS FUN AND ADVENTUREOUS. YOU GET TO CREATE SOMETHING FROM NOTHING AND WATCH IT COME TO LIFE! In all of the fun planning around things like ambiance, it can feel burdensome to worry about something like safety. But it’s important to properly plan for such measures when you’re in charge of an event and the people attending. When people attend events, they don’t think about things like safety – they expect that the organisers already have. So that if they do find themselves in an emergency situation, you will take care of them. It’s an important part of your responsibility in hosting an event. We’ve put together this starting guide to the basics of safety at events, in case you don’t know where to start. IDENTIFY POSSIBLE RISKS at your event so that you can then control those risks in an appropriate manner. In order to do this you must think about what might cause harm to the attendees at your event and determine if you are taking reasonable steps to prevent that harm. The goal with risk management is not to entirely remove risks, but to identify sensible measures to control the risks and ensure measures are in place that are reasonable if a situation arises. STEP INTO THEIR SHOES....stepping into the shoes of a worker or attendee and seeing the day from their vantage point. What will they see, where will they be, how will they get from place to place. A good place to start is to think about the safety of structures above their heads and what’s at their feet. Identify the hazards at your event, the potential of harm, what can be done to lessen the risk, and what will be done if something happens. These findings will create your risk management and safety plans. IDENTIFY EVENT NEEDS - identify the products you’re using at your event and the potential for harm. Have you chosen products that help alleviate safety concerns? Do your structures meet safety standards and have they got engineering certificates? What wind load and ballasts are required to keep structures steady and in place in high winds/ rain? For instance, Stretch Structures use the best material designed to meet most global fire, structural, and safety standards. The strong fabric contains built in fire retardant, adding an additional level of prevention to your risk management plans. They also come with engineering certificates and wind guidelines. AREAS OUT OF BOUNDS - Similar prevention methods should also include considering the best people to install electrical equipment and highlighting areas attendees should stay away from throughout your event. Choose products that will protect those at your event. Its always good to prepare an emergency plan just in case something does go wrong. It’s worth the extra level of protection and peace of mind. SAFETY FOR WORKERS AND ATTENDEES -The people at your event will fall into two categories – those working and those attending. You’ll want to ensure that those working your event have safe working conditions for themselves, plus the ability to help attendees in emergency situations. HELPING HAND -Structures and equipment can sometimes be very heavy so the more hands to help, the lighter the workload and the safer of workers. If you need installation staff, its worth investing in the cost to ensure that you look after your workers and ensure the installation is done correctly. OLD, YOUNG AND FRAIL- It’s also important to note the wide range of people you could have both working and attending your event and the individual needs they could have. People who could need more attention include those who are very young or old, those with severe allergies, expectant mothers, and people with disabilities. Responsible planning for your event will include taking these populations into consideration. Additionally, those working the event will be expected to be leaders in the case of an emergency. Go over safety protocol so workers are well prepared to help patrons with anything that arises, from sending someone to first aid to a full-scale evacuation. 4. TAKE CONTROL OF SAFETY AT YOUR EVENTS! It’s imperative that you consider safety at your event and understand you are responsible for ensuring measures are in place in the case of emergency. This guide just covers the basics of event planning safety and just touches on these important topics. It is by all means not an extensive list but a starting point to consider safety at your events. Check your local environmental and health safety laws to ensure you are considering all the safety elements at your events and to receive additional guidance to make your event a success. Nothing can ruin the fun and an exciting event like someone getting harmed. Add this very important component to your event planning process and make sure to take steps to alleviate possibilities of issues at your events. If you are using Stretch Structures and are concerned about safety at your event, contact us to discuss how we can help ensure the safety of our structures and your patrons. We take safety very seriously and have our own safety practices to ensure we are helping you plan for the best event possible. 7 reasons to choose inflatables at your next event. There are a lot of decisions to be made when planning your event. Luckily we take the guesswork out of one big decision that can make or break your event. This one thing can set the tone for your entire function and create just the right environment for your needs. The structures! And not just any structure, but one that draws attention to your event, is inviting to our customers and creates an ambiance that is remembered! The venue, setting, and environment are the biggest decision to be made and it all starts here. The decision you make here sets the tone for everything else. Inflatable structures made my StretchStructures make it easy to plan your event and create just the right setting. The decision is easy with these top seven reasons for using inflatable structures. As we like to say, your imagination is your only limitation. Inflatable structures give you more choices and control over the look and feel of your space than any other options available. From size to color to branding to shape – our design team are sure to create the perfect customized creation for you. They're portable and easy to assemble, which means you can save time and manpower. Some structures only require one person and 10 minutes to set up. The inflatable nature of the structure is meant to provide fast and easy set up that allows you to set the stage for your entire event faster. And get home at the end of the day. Accommodate up to 500 people in our variety of structures. Shells, domes, arches, or cubes – the choice is yours. The variety of sizes and shapes ensures you find the perfect one to set the tone for your event and take care of all your guests. The ability to print on these structures means you can save on other brand recognition efforts. No need for buying extra signage or figuring out how to attach banners to your structure to ensure they stay put and don't blow away. With inflatable structures, your logo and brand is represented right on the structure. You design your own logo placement with mockups and a graphic designer to assist. Inflatable structures are engineered tough to withstand the outdoor temperament, but can also be used to make indoor spaces pop. The modular nature of the structures, along with the variety of shapes and sizes, means you can use them anywhere you need that special extra something. Protecting guests from the weather or creating a pop of color indoors, these structures are fun to play with and are useable anywhere you need to go. Because the safety of your guests and the life of your products are important, inflatable structures are made with standard or fire retardant fabric, plus are built to withstand strong winds and other elements. Mother Nature shouldn't crash your event and with a sturdy inflatable structure, your guests stay safe while your product does all the work and lives to see many more events. All of the above provide excellent reasons for choosing an inflatable structure for your next event, but we also believe you should play with your imagination and create products that allow you to stand out from the crowd. These structures are fun and unique because they give you the opportunity to let your imagination run wild. Where will it take you today? Distinct and practical, inflatable structures give you choices and peace of mind like no other product available on the market. Contact us today to begin your journey to your imagination and the perfect event. From a bride whose passion is the environment to throwing an Earth Day festival, there are many reasons and opportunities to create an environmentally friendly event. Now more than ever, consumers are calling for better awareness around environmental impact and companies are being held to higher standards. You can hop on this smart train by approaching your events with the environment in mind. And these days, environmentally friendly doesn’t just apply to the picnics or events with a rustic feel. You can take any event and create a fun, stylish affair with the environment in mind. Every event evokes a particular emotion. Events are an experience that brings the guests along for a ride. And you are the train conductor. You determine what kind of ride your guests will have and where you want them to go. You get to decide how you want your guests to feel. A classic country wedding that invokes romance and simplicity, the feelings of days gone by. The big annual meeting that has employees excited about their jobs, the future, and increases feelings of loyalty. The family festival in the park that swells with laughter and encourages community, where parents leave grateful for a safe and fun place to take their kids. To that wedding guest, that loyal employee, and that grateful parent, that event wasn’t just a way to spend a few hours of their day. It was an experience to remember that lingers with positive emotions. And when they think of this event in the future, they’ll once again recall those emotions and think of it fondly. And that is exactly the point! So how do you create an experience that will have your guests evoking positive associations for months and possibly years to come? 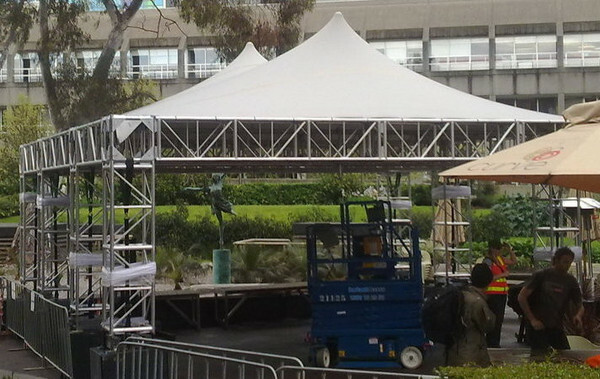 Using StretchStructures at your next event isn’t just about finding a tent to protect your guests from the weather. It’s creating an entire experience. And the easiest way to create this experience is through high-quality and well thought out event architecture. There are a wide variety of stretch fabric architecture, exhibition, and event products available to provide dramatic visual impact and to highlight the feeling of your event. Signage or company branding at festivals, conferences, events, and trade shows – make sure guests remember who sponsored their favorite event or who they interacted with. You can transform your space and demand attention with any of these exciting pieces. And with StretchStructures you know you are getting the same high-quality you’ve come to expect. The high performance stretch Lycra used in all of our architecture pieces is flame retardant, printable, and long lasting. We also make it convenient to use these products by keeping them lightweight, cost effective, easy to install, and a snap to pack down for shipping and moving. Stretch event architecture is a fun way to create your perfect setting, enthrall your guests, and ensure that feeling remains long after your event is over. Contact us today to create the experience you’re looking for. Let’s paint for you a picture……So people are still raving on about your last event you planned. They’ve commented on the fabulous food and entertainment. They’ve gushed about the stunning atmosphere. And they’ve thanked you for creating true ambience and an experience they’ll remember.